Smart buildings are high-performance buildings that save their owners money. Western States Geothermal aims to make buildings do more with less energy by constantly updating and applying technology in new and better ways. CEO Ron Pierce compared the energy efficiency of buildings to cars, “Right now many cars are engineered to let you know how much energy they are consuming at the instant you consult the gauge, and systems are in place to gain the maximum value of the fuel. Now the best and brightest minds that engineered high-performance cars are coming to the mechanical world of buildings. Our goal at WSG is to show how your building is performing in real time on a computer or smartphone. The improvements will be dazzling.” The time is right to build and update buildings to save more energy. The world’s remaining fossil fuel supply is more difficult to access and refine, and delivery of these scarce resources is more complex. Conservation is the logical answer not only for supply, but also for addressing global climate change—attributed to the release of carbon-based gases to the atmosphere and their greenhouse effects on planetary warming. As these concerns grow, the government and utility companies have been motivated to offer tax incentives and rebates. WSG’s first step is a feasibility study to determine what makes sense- -rebate options, system design, performance and savings. The federal Energy Star program offers a useful 30% tax credit program for retrofitting residences that expires at the end of this year. Another 30% residential tax credit extends through 2016 for geothermal heat pumps, small wind turbines and solar energy systems. Pending Congressional approval this year is a bill aimed at jump-starting commercial and apartment construction with energy conservation financial incentives. The State of Idaho echoes its support for energy conservation. Under Idaho’s Residential Alternative Energy program, homes with geothermal heat pumps, as well as wind, solar, photovoltaic and biomass systems benefit from a 40% tax rebate the first year and 20% for the three subsequent years with a generous $50,000 ceiling. 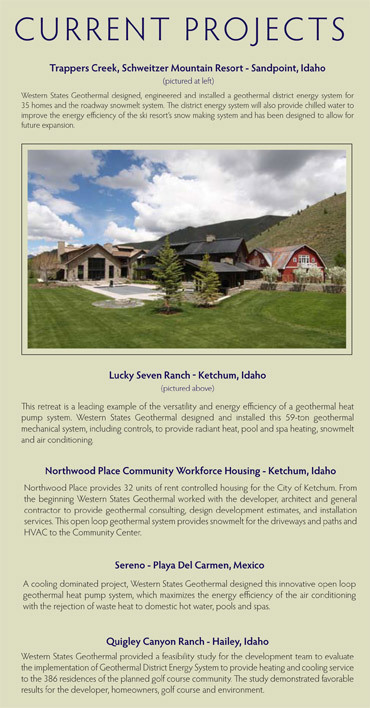 Idaho residents and commercial business can also qualify for low-interest loans for systems, including geothermal. Cash rebates of all kinds are available through the gas and electric utility companies for upgraded insulation, windows and appliances, and for more effective heating and cooling systems. 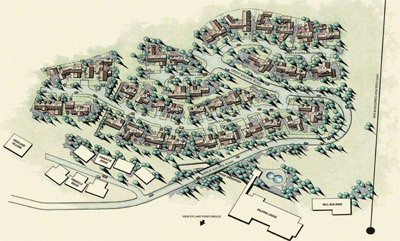 Helping people use less energy is the business of WSG whose headquarters is located in Ketchum. These savings are achieved through feasibility studies, planning, innovative designs, new and improved technology, retrofits, and performance monitoring. According to Ron Pierce, “WSG has roots in geothermal heat pump applications and we design, install, and monitor the latest in HVAC and heat transfer technologies. We believe geothermal technology offers substantial benefits. However, our engineering capabilities extend to solar, wind, high-performance HVAC systems, conservation measures, sophisticated controls and really anything that makes a building more energy efficient and less expensive to operate. We take a design-build approach that includes a feasibility study, a collaborative decision process with clients, engineering, full design, installation, monitoring, and maintenance.” To accomplish this, WSG has assembled a formidable team of skilled, licensed and experienced talent. The team and its engineers have all the necessary licenses for mechanical, plumbing, and electrical installations; the head electrician is a wizard with controls; the technology expert delivers the needed connections and communications; the project manager has 20 years experience with large complex commercial projects; and the company holds an unlimited public works license and is fully bonded and insured. Customer liaisons Troy Quesnel and Evan Lawler stay with the project to ensure that the results fully serve their clients’ needs, including alerting them to the rebates and tax credits that make the bottom line and future energy savings so attractive. “We stay tight with the clients, and even tighter with their energy bills,” laughed Lawler, emphasizing that the proof of their systems’ success is in lower energy bills. Clients come to WSG to initiate energy audits, building monitoring, upgrades, or design-build projects. Typically with the feasibility study and design-build process, WSG joins the team at the onset of the building’s conceptual design. At this point, the building can be properly oriented and the best renewable energy system can be designed from the ground up through close coordination with the architect, builder, and owner. Building monitoring is a key program closely tied to service and savings. WSG makes monitoring look deceptively easy with a state-of-the-art monitoring system. “We monitor the HVAC system’s performance from our office, and we can tweak things from here to get maximum performance. If we observe any problems with a pump, furnace or boiler, or sense a leak, our service department is there, making the repair before there’s damage or inconvenience. Owners committed to lowering their environmental impact and bills have had great success by observing the instant feedback. In fact, one owner dropped the utility bill from $5,000 a month to $1,500 through monitoring and performance corrections,” recounted Evan Lawler. At WSG’s headquarters in Ketchum, staff can change temperatures and make adjustments for properties located around the world with one thing in mind —high performance, which equates to saving money. Similarly homeowners can track what’s going on from anywhere with an Internet or mobile connection. “We offer three different packages for different levels of monitoring,” added Lawler. For existing buildings, WSG offers energy audits. “We assess what the current energy demand is by evaluating existing equipment, counting appliances and calculating the loads and energy cost,” described Ron Pierce. “Then with a target for savings, we make recommendations through a feasibility study. If it doesn’t make sense, we don’t recommend it.” WSG considers a breadth of systems in the feasibility study: high-performance HVAC, geothermal, a combination of high-performance heating and geothermal or solar, furnace or boiler replacement, and hybrid systems that maximize the benefits of temperature differentials. “For the mountain environment, geothermal-boiler hybrid systems work especially well when snowmelt is used,” noted Pierce.